Rio Highlights: Japan's Kohei Uchimura, World's Best Male Gymnast, Shows Why : The Torch Kohei Uchimura, who has been the best in the world for seven years, kept his Olympic title in the all-around. American Kristin Armstrong took a third gold in cycling — a day before turning 43. 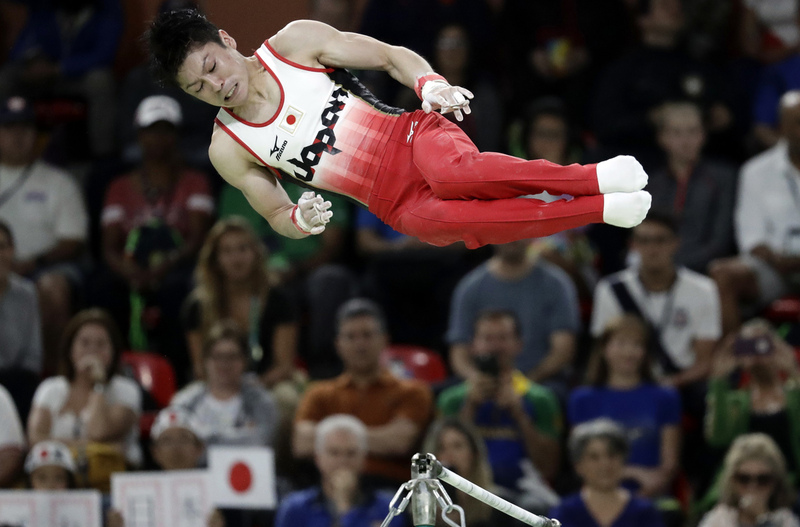 Japan's Kohei Uchimura performs on the horizontal bar during men's individual all-around final on Wednesday. Uchimura, widely considered to be the best male gymnast ever, repeated as the gold medalist in the event. With a dramatic performance on the high bars, Japan's Kohei Uchimura defended his Olympic title in the men's individual all-around on Wednesday and added to his lustrous reputation as the best male gymnast ever. Uchimura, who has won every all-around title at the world championships or the Olympics since 2009, was heavily favored. But after five of the six events, he was slightly behind Ukraine's Oleg Verniaiev. They were the last two to compete in the final rotation, on the high bar, and Uchimura scored a huge 15.8 — a full point higher than Verniaiev, who had to settle for silver. On Monday night, Uchimura, 27, led the Japanese men to the team gold medal for the first time since 2004 in Athens, competing in all six events. He has now won seven Olympic medals, three of them gold. 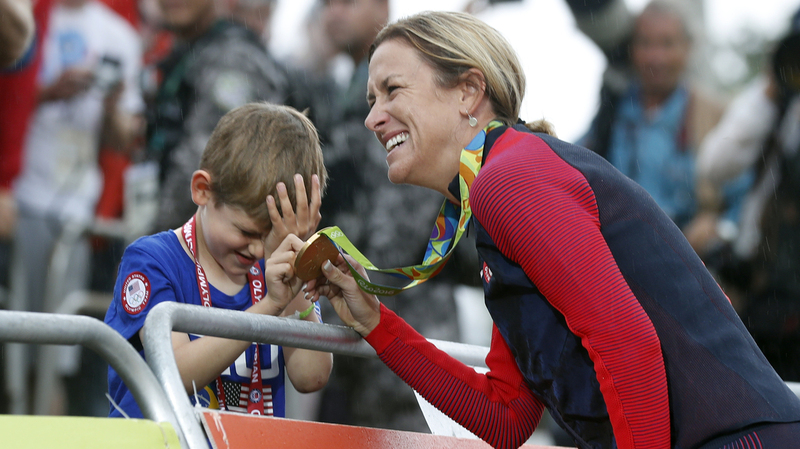 Cyclist Kristin Armstrong of the United States shows her gold medal to her 5-year-old son, Lucas, after she won the women's individual time trial on Wednesday. Armstrong, who turns 43 on Thursday, became the first cyclist to win the same event in three Olympics. Kristin Armstrong gave herself an early present for her 43rd birthday on Thursday, in the form of her third gold medal. She battled slick, rainy conditions to win the cycling time trial, just as she did in London four years ago and Beijing eight years ago. That made her the first cyclist to win the same event in three Olympic games, according to Olympic historian Bill Mallon — despite cyclists having raced at every modern games. She finished a course of just under 30 kilometers in 44 minutes, 26.32 seconds to beat Russia's Olga Zabelinskaya by five seconds. Armstrong, who works at a hospital in Boise, Idaho, had retired twice previously but came back again, as strong as ever. She broke into tears after winning, and raced to the sideline to embrace her 5-year-old son, Lucas. 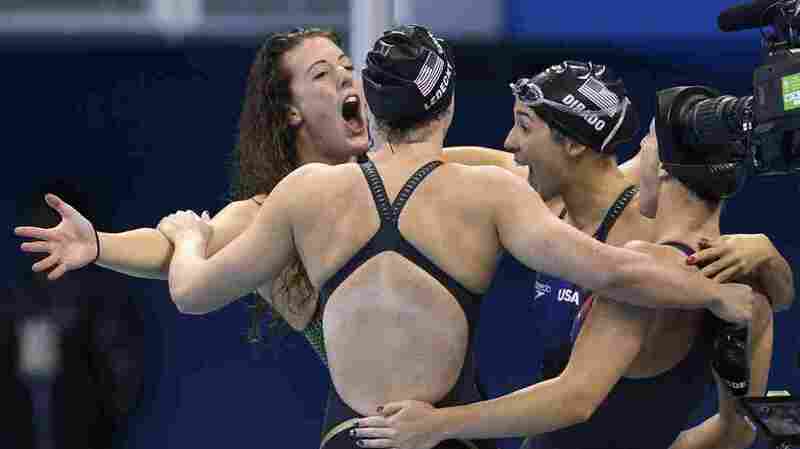 Allison Schmitt, Katie Ledecky, Madeline "Maya" DiRado and Leah Smith celebrate after they won the women's 4x200-meter freestyle relay for the U.S. Wednesday night at the Rio Olympics. The U.S. women's 4x200-meter team, anchored by Katie Ledecky, landed another gold medal on Wednesday night, while Nathan Adrian added a bronze in the 100-meter freestyle, and Josh Prenot won silver in the men's 200-meter breaststroke. U.S. swimmers now have a total of 21 medals in Rio — two-thirds of Team USA's total from all sports — including eight gold medals. It was Ledecky's third gold medal of these games. Melanie Margalis, Alison Schmitt and Madeline Dirado finished their legs just a second behind the Australians, and that was more than enough for Ledecky, who finished a second and a half ahead of the pack. The water in the diving pool at right is a murky green, in stark contrast to the clear blue water in the water polo pool at the Maria Lenk Aquatic Center on Tuesday. Officials say the green tint was the result of algae, which grew because of a lack of disinfectant. Americans also swam the fastest times in three semifinals. On Thursday night, Simone Manuel will try to repeat her performance in the women's 100-meter freestyle, while Ryan Lochte and Michael Phelps will aim to do the same in the 200-meter backstroke and 200-meter individual medley, respectively. In one other notable result, Kazakhstan's Dmitriy Balandin won his country's first-ever swimming medal — a gold — in the 200-meter breaststroke. The Internet can stop with the swamp jokes. It was only a little algae. 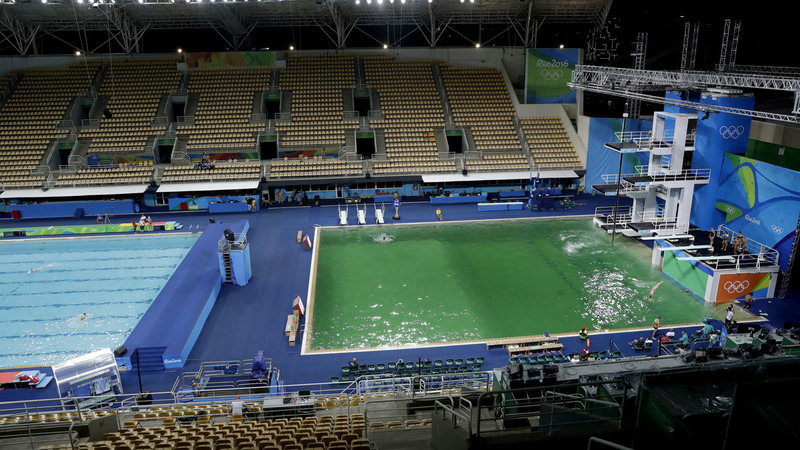 The diving well turned dark green on Tuesday, and with no official explanation, social media provided its own. It didn't help that so much attention already has been paid to the contaminated bay and the ocean areas where outdoor water sports are being held. The cause for the green water was simply a lack of chemicals needed to disinfect the pool, according to officials. Divers take part in training before the men's synchronized 3-meter springboard diving final. The water in the pool was still green on Wednesday, but appeared to be returning to normal. "As a result, the pH level of the water was outside the usual range, causing the discoloration," said FINA, the international swimming and diving body, which added that the water posed no health risk to divers. The water was a lighter shade of green on Wednesday, but still far from its traditional clear blue.